Response: Without devoting the necessary time to do the research in a way that would satisfy historians and scholars I don’t have a definitive answer to your questions, so this response comes with a caveat that it is based purely on my own speculation derived from my travel experiences and my limited study of musical instruments – and percussion instruments in particular. One observation is that there is a virtually universal human fascination with the sounds of birds. One sign of that fascination is the ubiquity of imitation bird-calling devices – small whistles, block flutes, reeds, scrapers, and much more – that can be found in cultures all over the world. Many such devices can be easily made from locally available natural materials, and they have probably been around for centuries, if not millennia, as practical tools in the hunt for food, or as a means to connect spiritually and aesthetically with the natural world. “Hänsel und Gretel” premiered in Weimar in 1893. 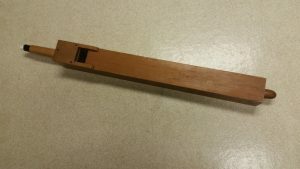 Photo of a standard wooden organ pipe. Certainly, there had been many types of pipe organs – small and large – throughout Europe for centuries. Most organs had stops consisting of wooden pipes, each of which was a kind of block-flute that sounded when air, triggered by a keyboard mechanism, was forced through the pipe’s blow hole. Also widely available in Germany since around 1730 were cuckoo clocks from the Black Forest region of southwestern Germany. Franz Anton Ketterer, a master clockmaker from the Black Forest village of Schönwald, is credited with inventing the technology used to create the sound of the cuckoo clock’s chirping call at the top of each hour. Using a system of two small bellows and pipes [basically miniature block-flutes, very similar to small wooden organ pipes], the distinctive “koo-koo” sound of the German cuckoo clock was developed. Two small pipes were attached to the tops of two air-driven bellows that could mechanically send alternating puffs of air into each pipe to make alternating high and low pitched whistle-sounds mimicking the call of the cuckoo bird. It would be very simple step to adapt this basic technology for the purpose of making a hand-held, mouth-blown device for use as a toy or a lure. This is a lifesize photo of an all-wooden cuckoo call with a stamp indicating “Frank Wolf Drummers Supplies – NYC”. This call was probably manufactured around 1940 to 1955. The wooden ball on the right is connected to a wood rod with a thin wood plate on the inside that can be moved in and out to alter the size of the air space to finely tune the overall pitch of the call. Of course, the higher note of the 2-pitch cuckoo call is produced with the finger hole uncovered. By covering the hole the lower pitch is produced. So, in answer to your questions, I do not think that Humperdinck was influenced by cuckoo callers being used as sound effects for motion pictures which were still in the very early stages of development. That kind of use wouldn’t even have been possible until the spread of movie houses in the first two decades of the twentieth-century, although it is possible that cuckoo callers may have been used in Germany and elsewhere in live theatrical productions. That being said, my educated guess is that cuckoo call devices – much like the whistles used today for “Hänsel und Gretel” (see the photo below) – were easily available in Germany by the 1890s. The sound of the cuckoo fits very nicely into the opera’s story as the main characters wander through the dark forest.